Plans to demolish the two-story Il Massimo building at 439 Washington Street and construct a skinny 22-story hotel with 189 rooms over 3,500 square feet of retail space upon the Financial District site have been in the works since 2015. While the site is principally zoned for development up to 200-feet in height, it’s positioned in a “transitional zone” between Downtown and the Jackson Square historic district. 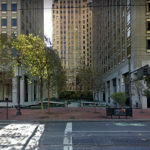 In addition, based on Planning’s preliminary review of the plans, the proposed 200-foot tower was projected to cast shadows on a number of nearby public parks and open spaces, the significance of which could be disallowed by San Francisco’s Sunlight Ordinance. 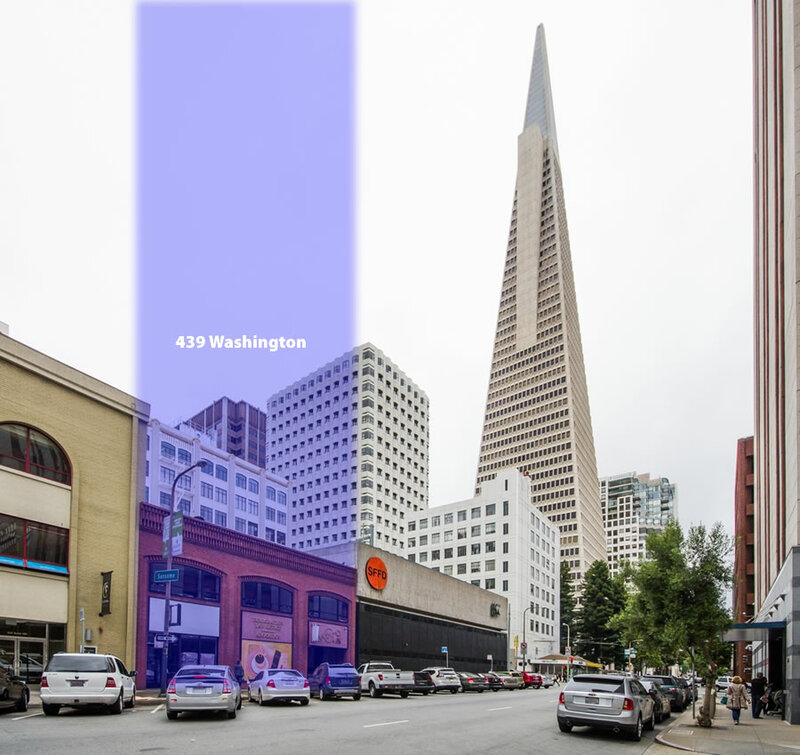 As such, San Francisco’s Planning Department was recommending that the height of the proposed development be cut in half, as we first reported at the time. 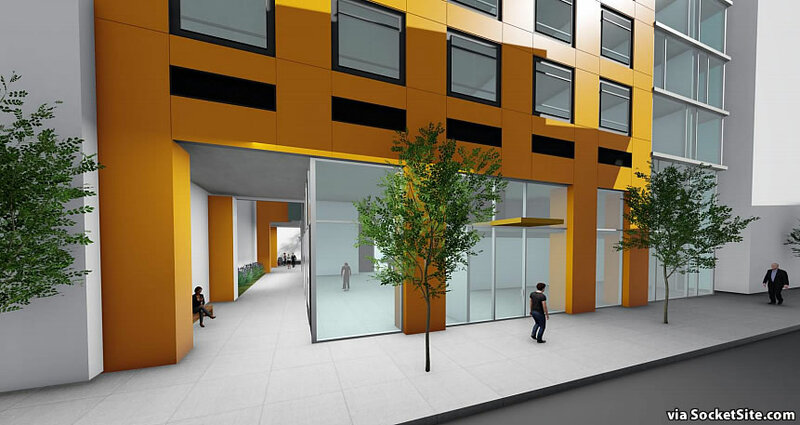 And the proposed hotel to rise on the site has since been redesigned by Stanton Architecture for Peninsular Realty. As such, the proposed tower would now yield 315 hotel rooms, with a ground floor lobby and bar fronting Washington Street, a small retail/café space fronting Merchant Street and a mid-block “POPOS” passageway between. Interesting is always “ugly”. That’s why we end up with so much bland architecture. Build it! D: We made it taller. I won’t much miss the building: I remember it as the final home of “Zotts”, a (former) hole-in-the-wall which had been forced out of it’s old home in order that – rather than having a character-rich restaurant – we could have two unmemorable ones instead. A perfect metaphor of SF in general, perhaps. somewhat like the design which is unusual for me – maybe it’s some kind of Friday the 13th thing. Anyway, it’s broken up. The base bronzy color is intimate and the top half setbacks and rooftop overhand makes this building one that pedestrians will take a second look at. Much better than the unarticulated boxes that dominate most SF hi-rise architecture. That above said, this is DOA. TTHD will stop it – if necessary by initiative as they did with 8 Washington. It’s hard to see any development happening on this site – 10 stories might not past muster with TTHD. 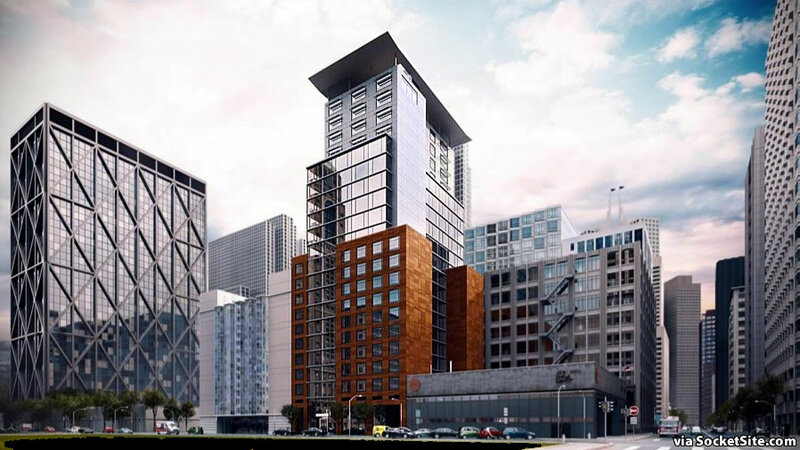 It would be nice if the developers of the hotel on Second Street “stole” this design – the one proposed for that site as recently redesigned is pretty bad. Agree. Especially with Peskin in office, this is dead. I don’t know that THD has weighed in on the earlier proposal for a similarly-sized tower around the corner at the site of the “Cort” building. Not just that, but there were actually three – count em, three!! – SSer’s that opposed demoing the existing building. That has to be some kind of record and must have triggered some ordinance. Awful people hell bent on making San Francisco mediocre. 8 Washington was a good plan….An initiative was put in for the benefit of less than one hundred people. But yeah, we know how this is going to go. It sort of looks like the architect is making a comment on facade-ism, with one facade behind another behind another, each one taller than the last. Started ok on the bottom to the mid, then lost it on the top (also no relevance adjacent to the Transamerica tower). they should look to change the top and extend the glazing from the front around and UP, keep it simple and don’t have so many materials with a roof/cap.